Rings enhance your hand and make it look beautiful. If you love minimal jewellery, you can try wearing these small rings as well. After necklace and earrings, the leafy rings is such a jewellery that has become a staple thing in the jewellery box. There are plenty of options that you can choose from as these leaf-shaped rings are quite trendy. 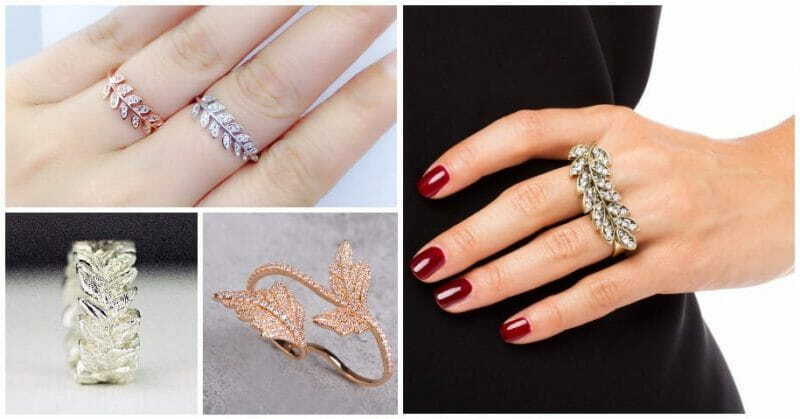 Let’s have a look at these stylish leaf rings that you can swear by! Wear this two-finger ring with a leaf design if you are looking for a heavy look. Two finger rings are worn on obviously two fingers (duh!). This type of ring will give you a royal look. If you are going to a party or a wedding function, then this heavy gold leaf ring will be just perfect. From saris to pretty dresses, it will look good with every outfit. If you are someone who loves Bohemian style then this ring is perfect for you. It is of silver or oxidized shade looks very good on your fingers. For a unique look, you can also wear more than one ring on one finger as well. Band Rings are trending these days and everybody already loves it. Couples are also choosing these types of rings as engagement rings. It is that type of a ring that can be worn regular. No matter how much we deny, but gold does have the power to make anything look stunning. Especially this beautiful gold leaf ring enhances the beauty of your hands as well. There are also special designs made by combining diamond in it.